A Reading from The Psychic Partners makes a great gift for Engagements, Weddings, Holidays, Birthdays or just to say “I Love You” or “Congratulations.” Gift Certificates are available in any denomination. Upon completion of processing your order, we will immediately mail to you or your recipient(s) a personalized gift certificate, inscribed as you wish inside of a beautiful greeting card. In addition to sending your email request for a Gift Certificate, please make payment on the FEES page of this website by selecting either the service you would like to purchase as a gift, or you can request a Gift Certificate of any amount (in $5.00 increments). Just select Gift Certificates, click on add Add to Cart and choose the quantity of $5 increments that add up to the amount you want to purchase. 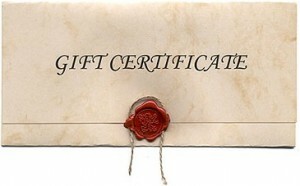 For example, in the Quantity column you would put 10, if you wanted to buy a Gift Certificate for $50.00. If you have any questions, please feel free to email us at info@thepsychicpartners.com or you can call Loretta Vasso at (215) 692-2753. This site is only for entertainment purposes. Information provided does not constitute legal, psychological, medical, business or financial advice. You must be 18 years or older to request a Reading from one of our Psychics or Mediums. Copyright © 2009, ThePsychicPartners.com. All Rights Reserved.